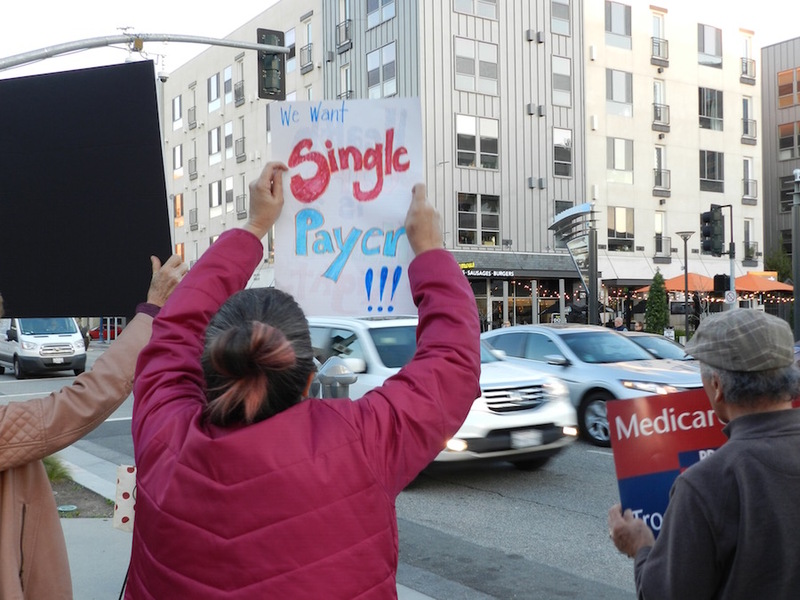 State Senator Ricardo Lara spoke at his first rally outside Sacramento Friday night at Harvey Milk Park where he asked his home-district constituents to pledge their support in his fight to bring a single-payer healthcare system to California. Nearly 200 people gathered on the northernmost end of the promenade in downtown Long Beach to hear Lara speak about his vision that he unveiled last Friday,the state legislature’s deadline to fill new bills. Lara, battling a cold, joked that he was in need of healthcare himself before launching into his speech. Lara’s bill, which was coauthored by Senator Tony Atkins of San Diego, comes as Congress deliberates what to do with the Affordable Care Act in the wake of President Donald Trump’s campaign promise that it would be “repealed and replaced” after he took office in January. 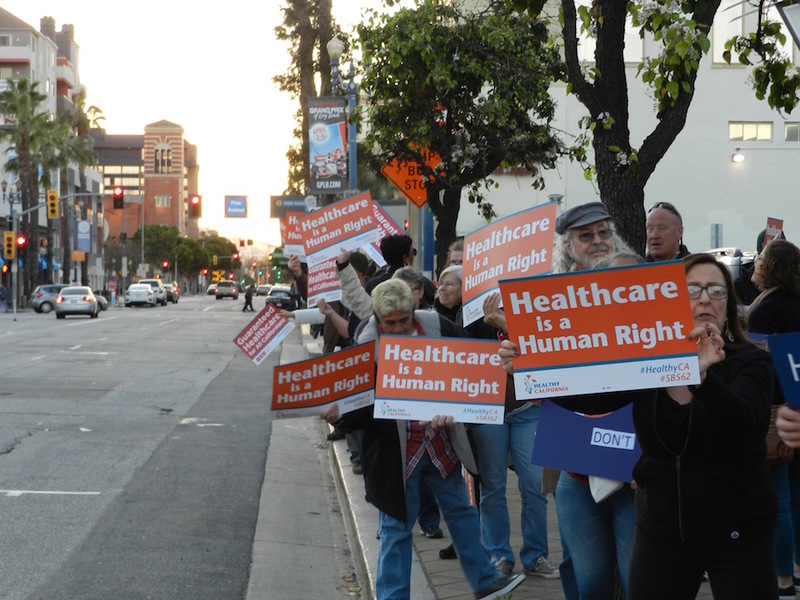 The rally was organized by the California Nurses Association (CNA) and was attended by several local grassroots community groups, many of whom waved signs supporting the bill, SB 562. Mayor Robert Garcia noted that the bill’s number was no mistake, as it was meant to highlight the area code of the largest city included in Lara’s district. Garcia, who became the first mayor to officially endorse the bill, shared a story of his own father, who up until two years ago was without medical insurance. He recounted how he sat down with his dad, who lives in Nevada, and helped him sign up for Obamacare. Garcia added that his dad has never been happier than in the past two years with his new health coverage. “It’s amazing to me that we have a president right now in Washington that is doing everything he can with a congress that is stuck decades, decades ago and he’s trying to take away his rights, take away healthcare and not expand coverage, which we should be doing, but diminishing coverage and diminishing people’s civil rights and human rights,” Garcia said. 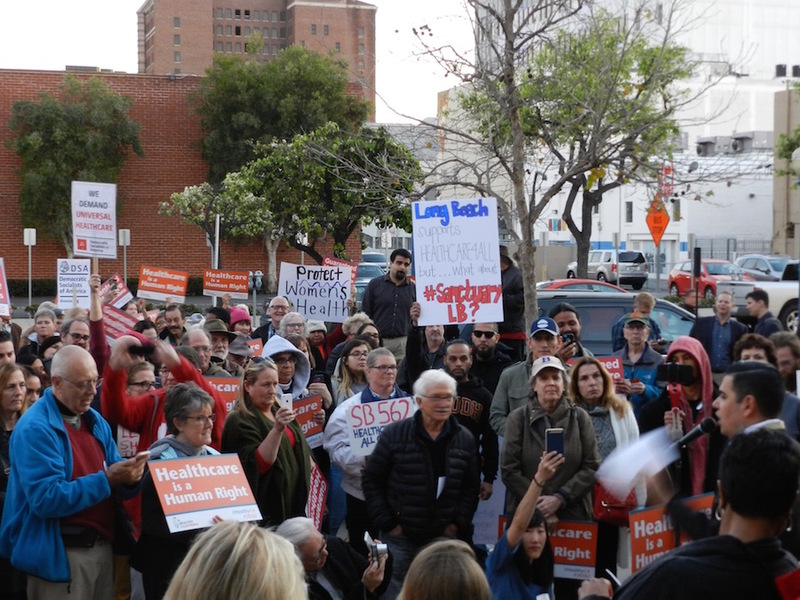 The crowd’s age and diversity was representative of what has come to be expected at a political rally in Long Beach; senior citizens and youth of all ethnicities and walks of life came out to support Lara’s efforts to push the bill through the state legislature. Lara said that was why he was more than happy to make the trip downtown to wave a sign at passersby. Yosh Yamanaka, a retired state employee, said that while his healthcare situation is fine as he’s covered under his California retirement benefits, he knows that is not the case for all people in the Golden State. Myron Wollin, the president of the Long Beach Grey Panthers, laid out all the benefits that seniors receive from medicare coverage—notably that his bills are paid and he doesn’t have to make tough choices that others do regarding their health. The path to getting SB 562 passed will not be an easy one. Garcia acknowledged that while California Democrats enjoy a supermajority in the state legislature, it will take constituent pressure to ensure that all those party members support the bill. A similar effort that was approved by the legislature was vetoed by the governor in the past. The bill promises lower premiums and copays as well as provide choice of doctors, promises that echo the rhetoric thrown around before Obamacare was adopted. Whether or not that could serve as an obstacle for the bill as people who saw Obamacare fail to deliver similar pledges remains to be seen, but Lara is confident that the differences between SB 562 and Obamacare will be enough to win people over, namely the ability of residents to create a pool that will allow for better bargaining power for services and medicine. He also rebuffed the idea that the provision in the bill that would allow for services to be extended to undocumented adults—Lara previously succeeded in pushing through a bill that insured over 185,000 undocumented children—could be a potential stumbling block for the bill. “They end up in our emergency rooms and cost us three times the amount, so it makes sense to allow them to not only be part of the system but have them pay for being in the system,” Lara said. SB 562 is currently bare bones in terms of what healthcare bills typically are. Obamacare, in its initial form, clocked in at around 2,700 pages long. Lara’s bill is less than 500 words in its current form. He said that over the next few weeks senate committees will dive into the process of determining the details and modeling schemes, both of which will be dependent on the amount of funding the state will continue to receive from the federal government. Whether or not the bill, if it becomes law, will be mandatory is still up in the air, Lara said. Until then, Lara said that healthcare will join the plethora of issues—immigration, LGBTQ rights, and women’s rights chief among them—that the state is opposing the Trump administration on. If he’s going to double down on campaign promises, Lara said, California is going to triple down. “As Trump’s tyranny on healthcare continues, his attack on the Affordable Care Act, which has helped us get insurance for a whole host of folks, now is the time for us to finish this once and for all, to ensure that everyone has healthcare,” Lara said.